I’d mentioned in my More than 36 hours in NYC post that the only repeat on this trip was Jean Georges. 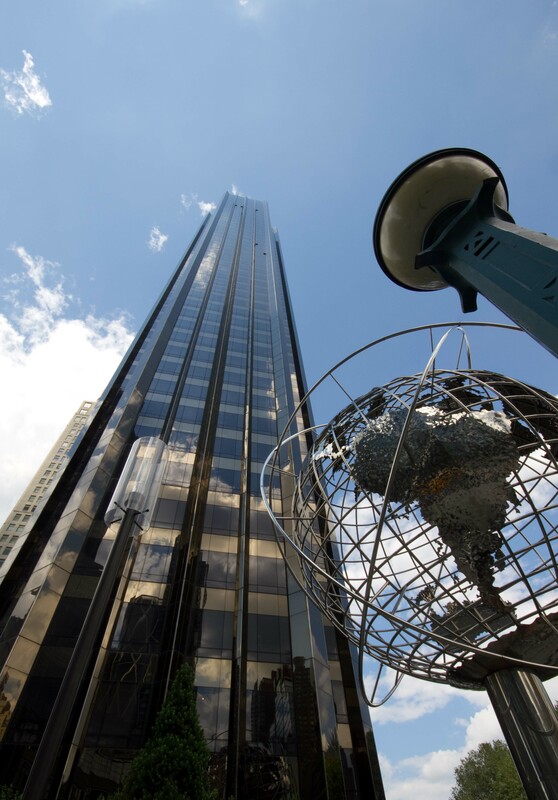 Located at the bottom of the Trump Tower on Columbus Circle, the prix fix lunch for $28 is a very accessible way of experiencing 3* dining and worth getting dressed up for! The room at Jean Georges is one of my favorites. There’s so much natural light, and with excellent sound-proofing so although the traffic of New York swirls around you, you’d never know. They also do an excellent job of not packing you in, so your dining experience seems very intimate. The $28 menu includes 2 items from their very long list. Being the good couple that we are, we decided if we shared, we’d get to have more tastes. 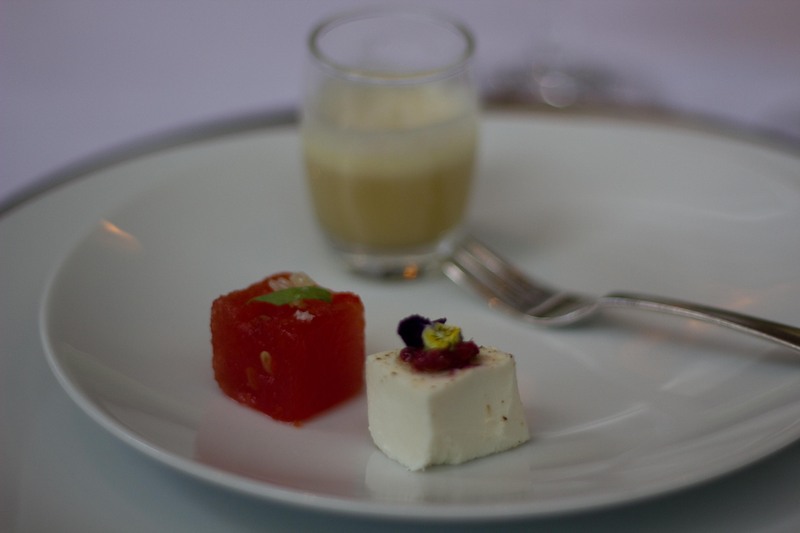 After our decisions were made, a trio of amuse bouche were quickly delivered to our table; watermelon infused with chili, homemade mozzarella with pickled raspberries and a chamomile infused chicken soup. The watermelon kept its texture but was shockingly spicy, the mozzarella was mild and buttery underneath the uniquely vinegary raspberry and the warm chicken soup would be the perfect cold remedy, (not that I didn’t love it in at that moment). There were so many things on the menu that looked good, and although I was leaning towards the seafood, in the end my choice is always the foie gras. 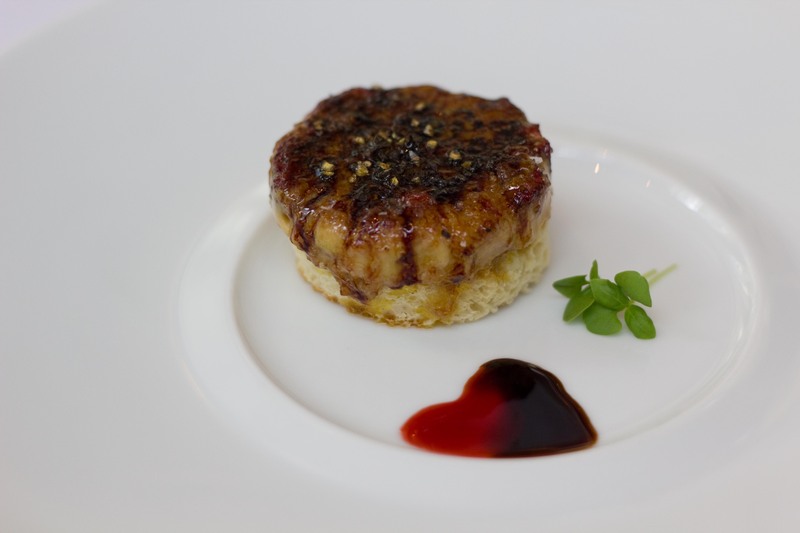 Foie gras brule on toasted brioche with strawberry balsamic reduction. I love how the top of the foie gras crackles when you cut through it. 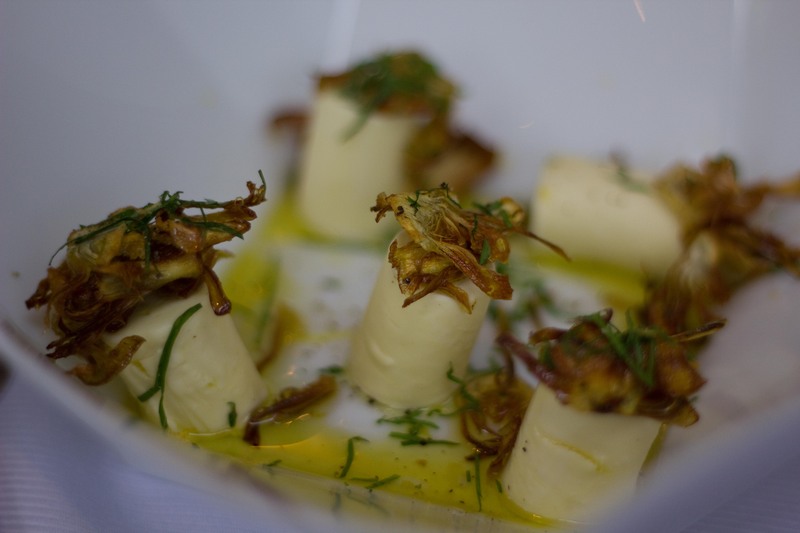 Ben chose the wonderful goat cheese gnocchi with baby artichokes, lemon and olive oil. The silky gnocchi were so delicately cheesy and near perfection when used to sop up the lemon infused olive oil. The crispy pieces of artichoke added a nice contrast to the dish. 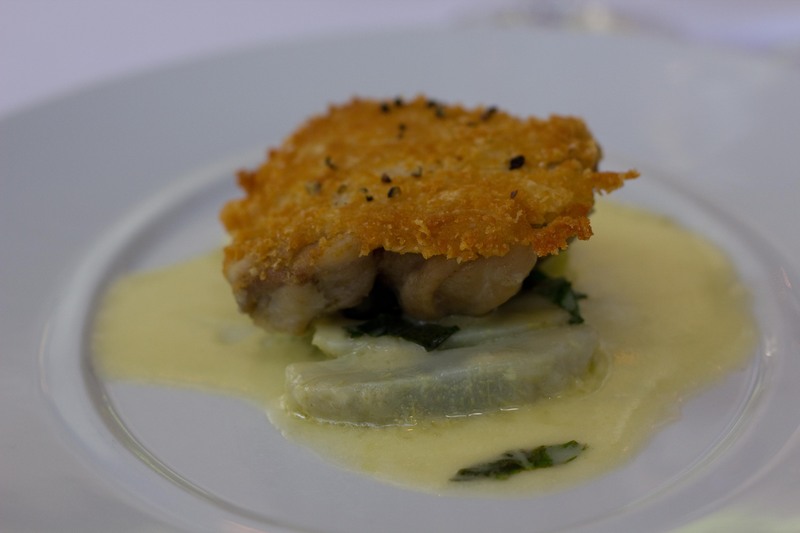 I never order chicken as a main in a restaurant, but was enticed by the parmesan crusted confit leg of chicken with artichokes, basil and lemon butter. This succulent dark piece of meat with its crispy parmesan “chip” on top, meaty slices of artichoke underneath and finished with an acidic lemon butter sauce was so amazing and probably the reason I don’t order chicken in other restaurants. It just wouldn’t compare. Ben’s choice was the tenderloin, (although I had secretly hoped he’d get the veal scaloppine or the snapper). I’ll mention a lesson learned here. In the future, I will take a photo of the menu, so you won’t forget what you’ve eaten. I know that this dish is served with squash, but can’t for the life of me remember what kind or what the sauce was. 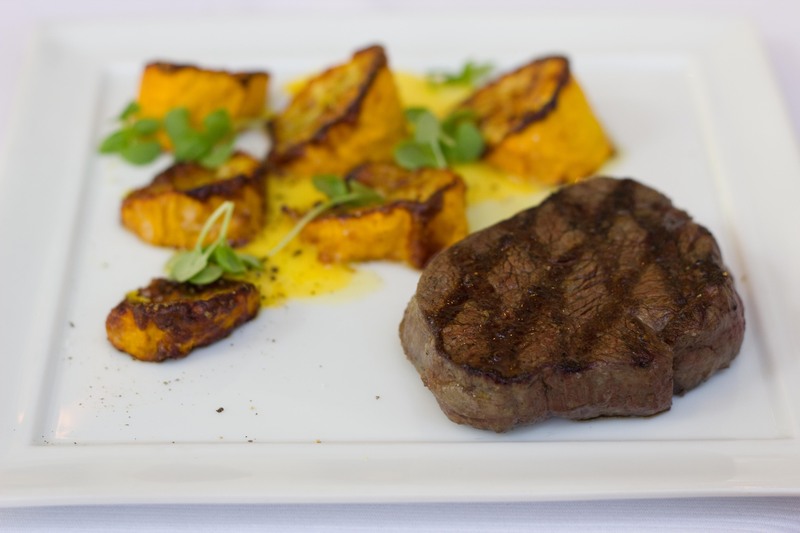 Perfectly seasoned, surprisingly flavourful (seeing as it was tenderloin), it’s hard to be disappointed in ordering something when it tastes so darn good. I do remember the unidentified squash was delicious. 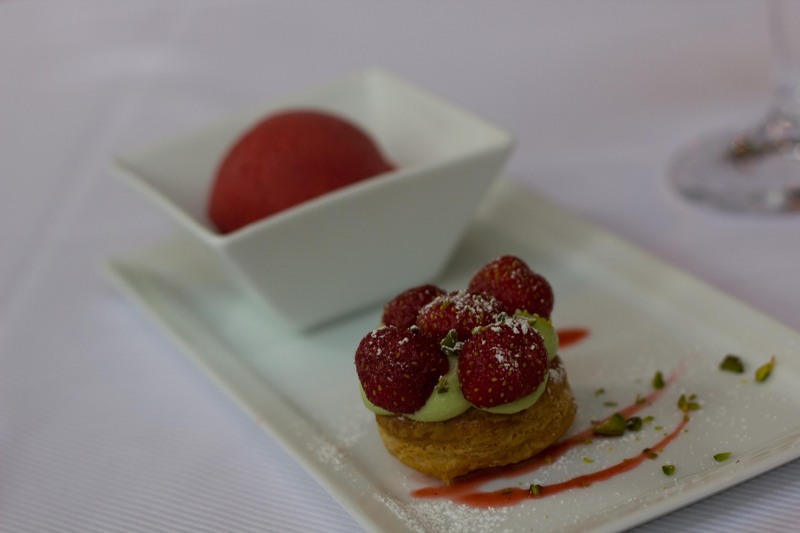 Strawberry tart with tarragon cream, pistachio and strawberry reduction underneath. Strawberry sorbet with crisp coconut puffed pieces. This dessert tasted like summer. Dessert was followed by the signature ends of the meal. Macarons, chocolates and beautiful homemade marshmallows. Marshmallows are one of my favorite things. 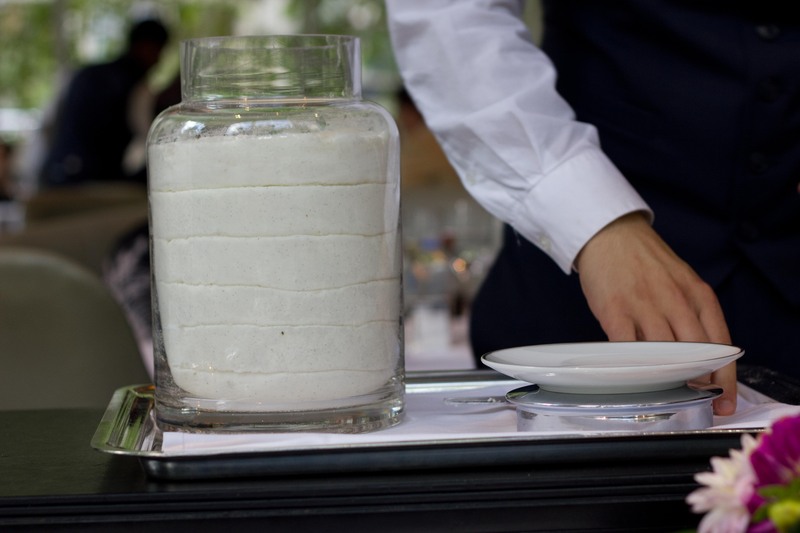 Jean Georges marshmallows served table side has put me off Kraft forever. 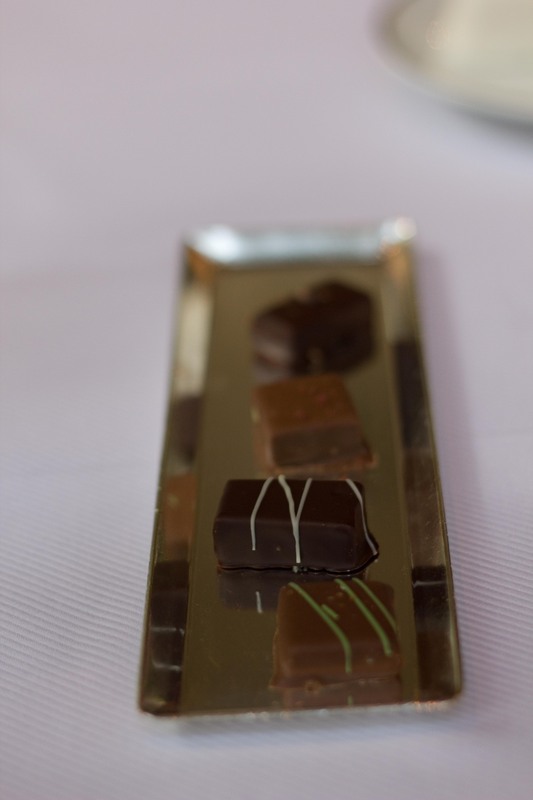 Again, I wasn’t really paying attention to which chocolates were what but all were delicious though. I’m hugely into macarons lately, so I was so happy to see them. These little treasures were filled with sweet strawberry jam. I remember reading somewhere recently that Michelin starred restaurants exist to serve exceptional food and give exceptional service. 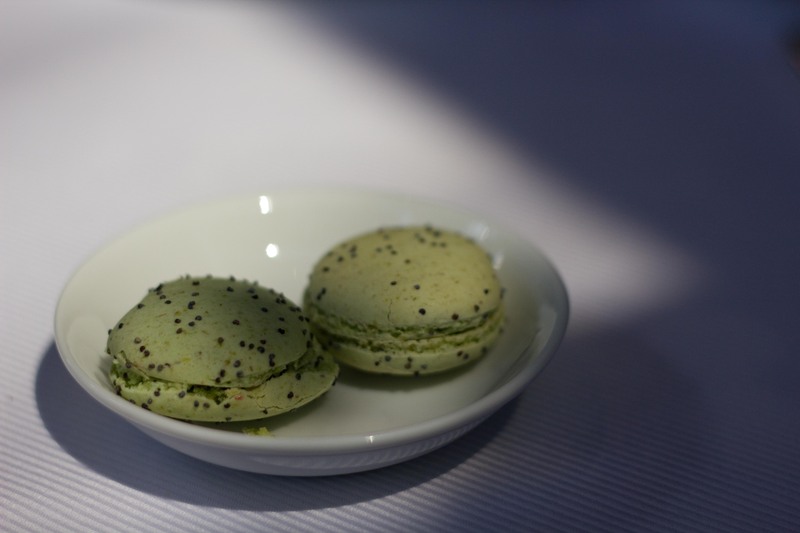 Three star Michelin restaurants should do that while also providing a magical experience. 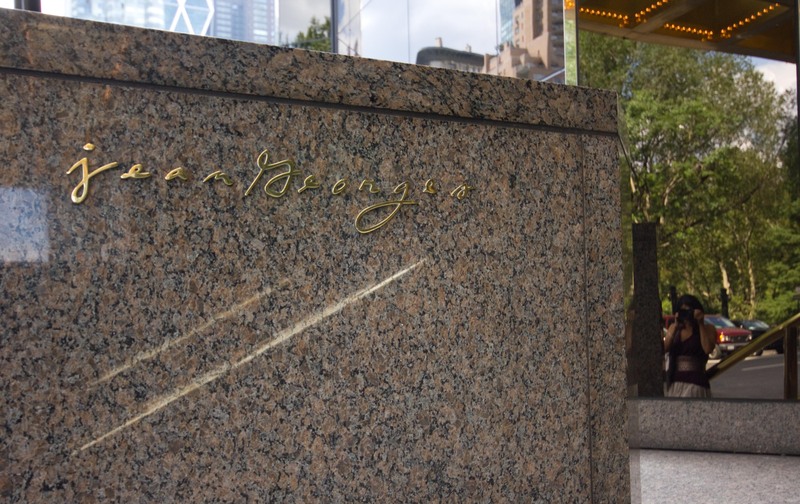 In my first visit to Jean Georges last year, I learned about the magic of Jean Georges. I loved it so much I eagerly anticipated a return visit. With such high expectations, I knew it was going to be difficult to exceed my initial experience. I’m happy to report the food met expectations, and the service? Well you can’t beat being asked how the meal was by the actual man himself. 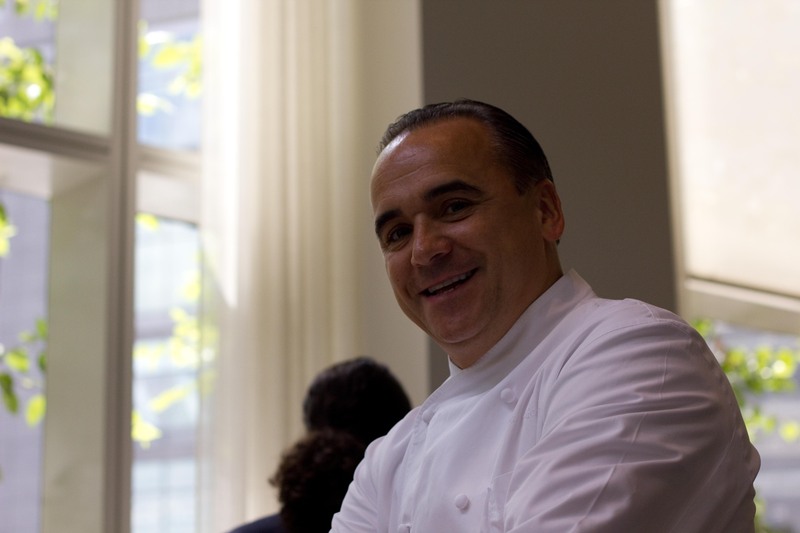 I was more giddy about meeting Jean Georges than any movie star encounter I’ve ever had.